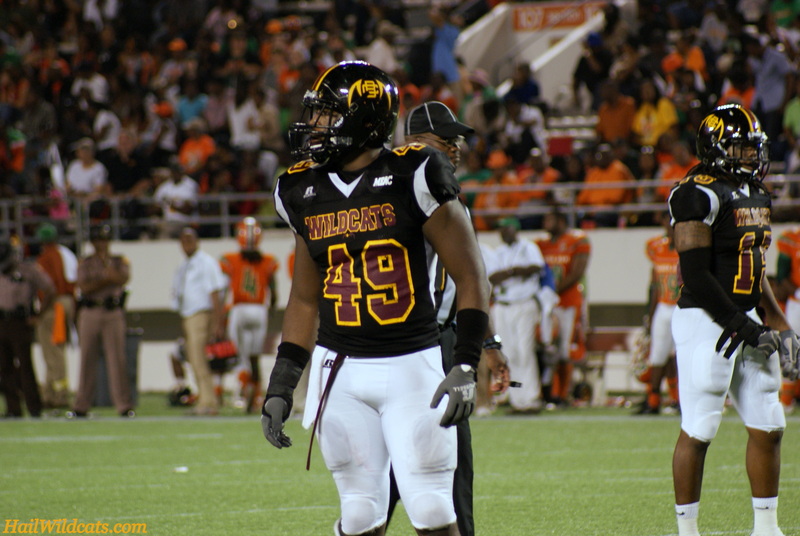 Associated Press– Bethune-Cookman’s Ryan Davis earned the Defensive Player of the Year honor as voted on by the MEAC head football coaches and sports information directors. Ryan Davis led the MEAC in sacks (12.0) and tackles for loss (21.5) and ranked in the top 10 nationally in both categories. He ranked third on the team in tackles with 65 this season including 40 solo and 25 assisted. He also recorded 17 quarterback hurries, eight forced fumbles, three pass breakups and two fumble recoveries. He was named the MEAC Defensive Player of the Week once this season and was named the FCS Defensive Player of the Week once by the Sports Network. Sophomore running back Isidore Jackson joins Davis as a first team All-MEAC selectee. Jackson finished the year as the conference’s second leading rusher gaining 866 yards on 146 carries with 7 rushing touchdowns. The MEAC’s Preseason Defensive Player of the Year, linebacker Ryan Lewis, was an second team selectee as were fellow linebacker Reggie Sandilands, safety Jean Fanor, offensive lineman Natiel Curry, and offensive lineman Terrance Hackney. Norfolk State quarterback Chris Walley and North Carolina A&T State running back Mike Mayhew were selected as the Mid-Eastern Athletic Conference’s (MEAC) Co-Offensive Players of the Year. Greg McGhee of Howard earned the Rookie of the Year award and Norfolk State’s Blake Matthews was selected as the Offensive Lineman of the Year. Seven-year head coach Pete Adrian of Norfolk State was named the Coach of the Year. Adrian led the Spartans to its first-ever MEAC football title following a 9-2 overall finish and 7-1 mark in conference play. The Spartans earned the conference title following a 47-14 victory over Morgan State on Saturday, Nov. 12. The No. 19th ranked Spartans rose to its highest-ever ranking in the Sports Network/Fathead.com FCS Top 25 poll and earned the MEAC’s automatic berth with the title. Senior Mike Mayhew capped off a tremendous four-year collegiate career with yet another conference top honor after receiving Rookie of the Year honors just three years ago. In 11 games Mayhew led the MEAC in rushing with 231 carries for 1,120 yards and nine touchdowns. He also caught 18 passes for 93 yards. Mayhew was named to the All-MEAC Preseason First Team and was MEAC Offensive Player of the Week once this season. He ranks 23rd in the nation in rushing and averaged 101.8 yards per game and 4.8 yards per carry. Chris Walley led the MEAC in most of the passing categories this season including total yards (2,309), average per game (209.9), efficiency (148.5) and completions (211). He also led the conference in total offense averaging 235 yards in 11 games. The 6-2, senior from Tallahassee, Florida ranks 18th in the nation in pass efficiency and 33rd in total offense. Walley completed 69.2-percent of his passes (211-305) with 17 passing touchdowns and ranked third on the team in rushing with 89 attempts and 276 total yards with five TDs on the ground. He was selected as the MEAC Offensive Player of the Week three times this season. Greg McGhee led the Bison and was third in the MEAC in total offense averaging 197.5 yards per game. The rookie connected on 56-percent of his passes (182-321-5) with 1,784 total yards and 13 touchdowns in 11 starts. He was second on the team in rushing with 388 yards on 116 carries with four rushing touchdowns. The Pittsburgh, Pa. native was selected as the MEAC Rookie of the Week five times this season. Blake Matthews aided a powerful Spartan offense that accounted for 4,319 total yards including 1,843 yards on the ground. Behind Matthew’s blocking Norfolk State finished second in the MEAC in total offense and passing offense. He provided protection for four different players to rush for over 200+ yards. He also allowed senior quarterback Chris Walley to throw for 2,309 yards and 17 touchdowns. Matthews was named MEAC Offensive Lineman of the Week once this season and anchored a line that only gave up 13 sacks on the year. QB Chris Walley r-Sr. Norfolk State Tallahassee, Fla.
RB Isidore Jackson r-So. Bethune-Cookman Mossy Head, Fla.
RB Mike Mayhew Sr. North Carolina A&T Charlotte, N.C.
TE Lamont Bryant Sr. Morgan State Newport News, Va.
WR Willie Carter Sr. Howard Denmark, S.C.
WR Xavier Boyce r-Jr. Norfolk State Virginia Beach, Va.
OL Kendall Noble r-Sr. Norfolk State Rocky Mount, N.C.
OL Steven Robinson r-Sr. Florida A&M Tallahassee, Fla.
OL Corey Gwinner r-Sr. Howard Ypsilanti, Mich.
C Shelly Anthony r-So. Florida A&M Atlanta, Ga.
DL Ryan Davis Sr. Bethune-Cookman Tampa, Fla.
DL Josh Turner r-Sr. Norfolk State Chesterfield, Va.
DL Pat Washington r-Sr. South Carolina State Hollywood, S.C.
LB Keith Pough r-Jr. Howard Orangeburg, S.C.
LB Corwin Hammond r-Sr. Norfolk State Louisville, Ky.
LB Donovan Richard r-Sr. South Carolina State Georgetown, S.C.
DB John Ojo Jr. Florida A&M Tallahassee, Fla.
DB Micah Pellerin Sr. Hampton New Orleans, La. DB Justin Ferrell Sr. North Carolina A&T Danville, Va.
DB Dominique Ellis r-Sr. South Carolina State Union City, Ga.
P Branden Holdren Jr. Florida A&M Jacksonville, Fla.
P/K Ryan Estep r-Sr. Norfolk State Chesapeake, Va.
QB Greg McGhee Fr. Howard Pittsburgh, Pa.
RB Asheton Jordan Jr. South Carolina State Summerville, S.C.
RB Travis Davidson Jr. Morgan State Redford, Mich.
TE Joe Hawkins Jr. Norfolk State Chicago, Ill.
WR Wallace Miles r-Sr. North Carolina A&T Atlanta, Ga.
WR Kevin Elliott r-Sr. Florida A&M Orlando, Fla.
OL Alex Harper r-Sr. North Carolina A&T Baltimore, Md. OL Terrance Hackney So. Bethune-Cookman Chapel Hill, N.C.
OL Lawrence Brewer Sr. Morgan State Fort Washington, Md. OL Branden Curry r-Sr. Florida A&M Hollywood, Fla.
C Natiel Curry r-Sr. Bethune-Cookman Miami, Fla.
DL Joey Christine Sr. Norfolk State Stephens City, Va.
DL Corey Berry r-Sr. Howard Orangeburg, S.C.
DL Zackary Stewart Sr. Morgan State Upper Marlboro, Md. LB Reginald Sandilands Sr. Bethune-Cookman Miami, Fla.
LB Delbert Tyler So. Hampton Monroeville, Pa.
LB Ryan Lewis Sr. Bethune-Cookman Pompano Beach, Fla.
DB Jean Fanor r-Sr. Bethune-Cookman Miami, Fla.
DB DeVonte Reynolds r-Sr. Norfolk State Warsaw, Va.
DB Christian Thompson Sr. South Carolina State N. Lauderdale, Fla.
DB Lanny Kelly Sr. Howard Richmond, Calif.
P Jordan Stovall Jr. Hampton Elgin, S.C.
P/K Trevor Scott r-Sr. Florida A&M Jacksonville, Fla.
Ret Geovonie Irvine r-Jr. North Carolina Central Durham, N.C.
A Wildcat football player has earned MEAC Offensive Player of the Week honors for the second consecutive week. Quarterback Jackie Wilson was selected as this week’s MEAC Offensive Player of the Week. Also honored this week was Corwin Hammond of Norfolk State (Defensive Player of the Week). D’Vonte Grant of North Carolina A&T and Tracy Martin of Morgan State was selected as the Co-Rookie’s of the Week while Lawrence Brewer, also of Morgan State, was named the Offensive Lineman of the Week. Blake Erickson of South Carolina State was selected as the Special Teams Player of the Week, respectively. Wilson (QB, 6-0, 210, So., Ft. Lauderdale, Fla.) completed 12 of 15 passes for 183 yards with one touchdown in the Wildcats’ 34-6 win over North Carolina Central. He also carried the ball nine times for 113 yards with another touchdown on the ground. Hammond (LB, 6-1, 220, r-Sr., Louisville, Ky.) recorded a season-high 12 tackles, nine solo, in the Spartans’ 14-10 win over North Carolina A&T to remain in first place of the conference standings. He registered five tackles for a loss of 17 yards including one sack for a nine-yard loss. He also forced a fumble and broke up a pass in the win. Grant (LB, 5-11, r-Fr., Charlotte, NC) collected a career-high 17 tackles, 15 solo, in the Aggies loss to Norfolk State. He tallied 3.5 tackles for a loss of 14 yards and recorded a broken up pass. Martin (RB, 5-9, 190, r-Fr., Beltsville, Md.) ran for 154 yards on 38 carries with two touchdowns in the Bears’ (12-0) shutout victory over Delaware State. Brewer (OL, 6-5, 290, Sr., Ft. Washington, Md.) graded out at 98-percent on his assignments as he paved the way for the Bears to record 314 offensive yards in the win over Delaware State. He helped the team post 289 yards on the ground and racked up five pancake blocks. Erickson (PK/P, 5-10, 165, Sr., Cantonment, Fla.) finished a perfect 4-of-4 on PATs and connected on a 22-yard field goal in South Carolina State’s 31-0 win over Howard. He averaged 38.8 yards on six punts, including a long of 66 yards. He also handled the kickoff responsibilities, averaging 58.7 yards on six attempts. Jean Fanor (B-CU) posted six tackles, two solo, with one interception and one forced fumble in the Wildcats’ win over North Carolina Central. The Bethune-Cookman offense racked up 525 yards of Total Offense spoiling the homecoming of 12,516 North Carolina Central fans. Isidore Jackson and Jackie Wilson both eclipsed the 100 yard rushing mark in Saturday’s contest. On the opposite side of the ball, the Wildcat defense held the Eagles scoreless until the 13:17 mark in the 4th quarter. DJ Howard led the Cats with 8 tackles. The Wildcats are currently playing as well as anyone in the MEAC and will look to continue their impressive late season push in a homecoming matchup against the surprising Morgan State Bears. Morgan State and Norfolk State are the only remaining 1-loss conference teams. MEAC ANNOUNCES WEEKLY FOOTBALL HONORS – MEACsports.com – The Official Site of the Mid-Eastern Athletic Conference. DJ Howard (S, 6-0, 185, r-So., Daytona Beach, Fla.) made five tackles in the secondary, three solo, as the Wildcats defeated Prairie View A&M 63-14 in the annual MEAC/SWAC Challenge presented by Disney. He scooped up a fumble early in the second quarter and returned it 31 yards for a touchdown. Howard also halted a time expiring score in the second quarter for PVAMU by capturing his first interception on the season. Nick Addison–blocked a punt and collected three tackles, two solo, in his collegiate debut against Prairie View A&M. Corey Mason–anchored the Wildcats offensive line that accounted for 500 yards of total offense against Prairie View A&M. Jamarr Robinson–accounted for 281 total offensive yards with three touchdowns in the Wildcats’ 63-14 rout of Prairie View A&M in the annual MEAC/SWAC Challenge presented by Disney. Click the above link to read the full story.